10% Tution Increase Is Killing Us All! A friend of mine was upset with me all because I spoke against the Penn State Tuition Increase. The friend said “Joe, you are a senior and you about to graduate, so why are you worried about the tuition increase if it is not going to affect you”. Obviously, my friend was not thinking. Maybe it will not affect me directly (for the moment), but how will I feel if I call a college friend to ask them how school is and all I hear is “I dropped out because the tuition was too high”. In the near or distant future, I will love for my kids to continue my legacy here at Penn State, but how will it feel (God forbid) if I can’t afford their tuition because its about $150,000? Yes, some of us are from rich homes and will be encouraged not to mind; but is everyone around you from a rich home? I doubt that. My friend was right. I should probably sit and watch since it is not directly affecting me, but I will be a fool in my eyes and in the eyes of God if I at least do not try to fight this issue and stand up for those who are weak and speak for those who can’t speak. I will be a fool because someone did it for me. Martin Luther King walked so I can live in America with goals and dreams as a young African. A lot of people sacrificed their lives for me to be here today. It will be foolish and selfish not to do the same for our future and our generation. I have seen enough friends drop out of school because of tuition increase and I say ENOUGH is ENOUGH! I still speak against it. Win or Lose, I WILL SPEAK! I will walk, run and march for change. Tuition increase is definitely killing us. 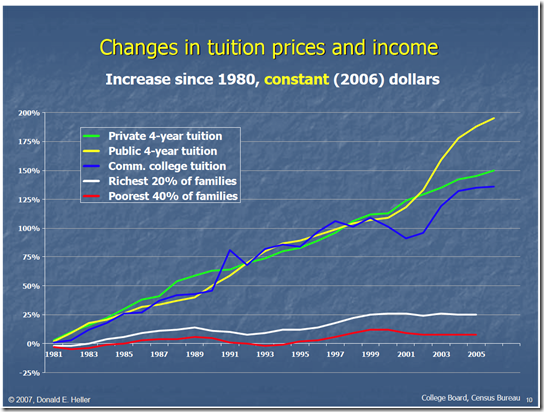 Statistically, tuition increase negatively affects minorities a lot more. We need to climb the ladder to success. We need to get to the top and we deserve the chance starting with good education. It is only right to fight for what is right! “I see no reason why I have to work 3 jobs, my dad has to work 2 jobs and my mum has to work all night just so I can be able to go to penn state? I see no reason why I have to dropout of school and stay home for 2 years and work my till I drop just to come back to penn state and get a good education. IT IS KILLING MY PEOPLE. As minorities,we want to do better,we want to succeed in life,we want to be comfortable,we want to move out the projects but how can we do this if we are left to become drop outs because we can’t afford good education. If we as minorities where not aspiring to be better,we probably would be in some community college. We came to Penn state for a reason. Against all doubt from our very unproductive neighborhoods, we are here to do better. Our hopes of making a better future for us and our families came from being accepted to penn state, BUT you PENN STATE are killing these dreams. You are leaving me no option but to go back home and be that “no future” child i never wanted to be. I deserve and education, and not just any but a GOOD education”. I knew I made the right decision the moment I step foot on this campus. Penn State is simply LIVE! It is a school with a lot of pride. The pride is what enables Penn State to be the school with the largest student run philanthropy in the world. The truth is, Penn State is highly respected around the world and the students actually have a voice. If you need to get anything done as an organization or company, Penn State students will be the way to go. I do not doubt our abilities and I do not doubt our vision and intellect. This past weekend, Penn State had 2011 THON FTK. THON is basically when the student body come together and raise money for kids with pediatric cancer by dancing for 46 straight hours. This year, the students raised about $9.5 million dollars ($9,564,016.09) to be exact. This is what I call the PENN STATE PRIDE! Penn Students do have hearts and do care about other people besides themselves. I never doubted this fact. I am proud to be a Penn Stater and I dedicate this entry to all of my friends who participated in THON 2011! You are more than blessed. A system is “an assemblage or combination of things or parts forming a complex or unitary whole”. Look around, everything is a system on its own or within a system: the 3 system of government, the cardiovascular system, reproductive system etc. (a whole lot). A relationship works like a system because there is an act of trying to make 1 out of 2. There is the attempt to combine 2 different individuals, most likely with different goals and ambitions, different genetic make up, different upbringing, etc. (Dang, no wonder relationships are hard to maintain). Any system set in place is meant to work, but anytime a system fails, it is usually the people who are within the system who are the cause of the failure of the system. The same principle applies to any sort of relationship. If a relationship does not work, it is because the members involved in that particular relationship failed at adhere to or do certain things which as a result crumbled the systematic aspect of the relationship as a whole. Don’t get me wrong, it might not be both people involved, it can be one person not willing to understand the other, one person not willing to make the decision to be in the relationship, one person not willing to work to sustain the relationship, one person being selfish, etc. (you know it, name it). Relationships (bf/gf) are very easy to get into but very hard to maintain. I have a theory: 25% of your energy is basically used to find the girl or boy of your dreams, but you need the 75% to help maintain it and keep it healthy. Everyone wants a healthy relationship, but only a few are willing to put in the work needed to have 1 or maintain one. Its like the man with the huge potbelly who is always talking about having a six pack, but all he does is drink a case of beer every single week. Catch my drift? We should all see relationships as a system, and we are the people upholding that particular system to work. I went to the movies with my girlfriend to see UNKNOWN. It was a great movie. As usual, I am always looking for the little wisdom in everything. One thing which stuck out to me was the words of an old man. The old man said “A the story of liar changes, but the truth remains constant”. This stuck it to me because I believe in the truth. I am not going to lie, but the truth at times is hard to tell. Have you ever lied and wished you never did? That is what lying does; lying can’t stand the test of time. The truth on the other hand, stand the test of time no matter what. I was about 10 years old when I first saw the verse “…and the truth shall set you free…” in the Bible. For a moment, I said to myself “who in their right mind will tell the truth if they are about to get killed for doing something wrong? I did not understand that scripture because I was young and I was enjoying lying to my mom to avoid the next belt. I grew up pondering about this and it made more sense the deeper I thought about it, including the experiences which came with it. The truth sets you free in the sense that, it leads you into a brighter path and it shapes you to become a better person. In my case, I would have learned some lessons about 10 years ago from the belt which would have saved me a lot of trouble now. The truth for a moment might cost you but in the long run, you will be at peace – something everyone is looking for in this world. There is no great feeling as feeling at peace even through the storms. Anytime you tell a lie, you will always have to come up with another lie to cover up the first lie; this brings discomfort and causes more problems. The truth leaves you at peace and it will make you feel good and help you feel comfortable as you attack and face the problem in the right and matured way possible. Once you tell a lie, you develop the tendencies of becoming a pathological liar for life. To become a better person, you do not need to grow up to become someone who lies for no reason. You will end help hurting yourself and the people you love most. The truth stands alone when everything fails around you.